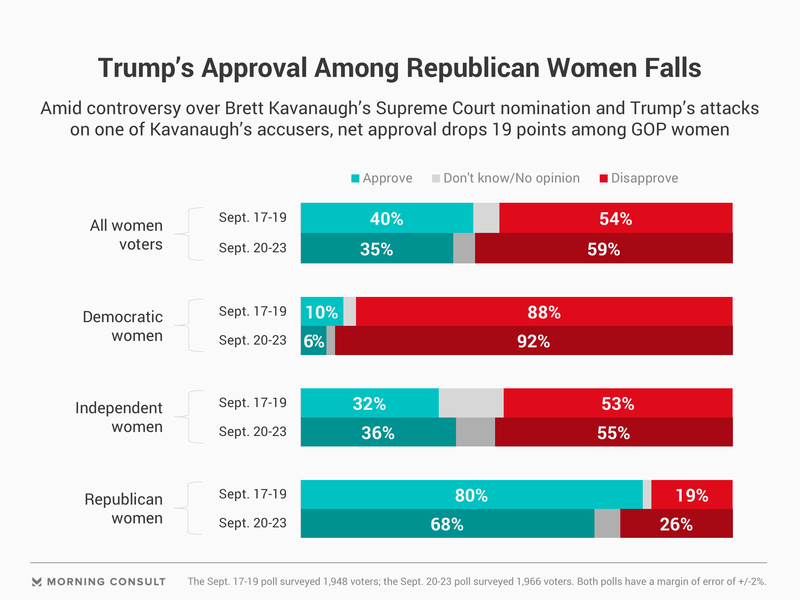 As anticipation builds for Christine Blasey Ford's testimony in front of the Senate Judiciary Committee tomorrow, a new Morning Consult and Politico poll finds Republican women are beginning to lose faith in Brett Kavanaugh and President Trump. The survey was conducted Sept. 20-23, 2018 among 1,966 registered voters before the New Yorker published their piece revealing the second accuser. 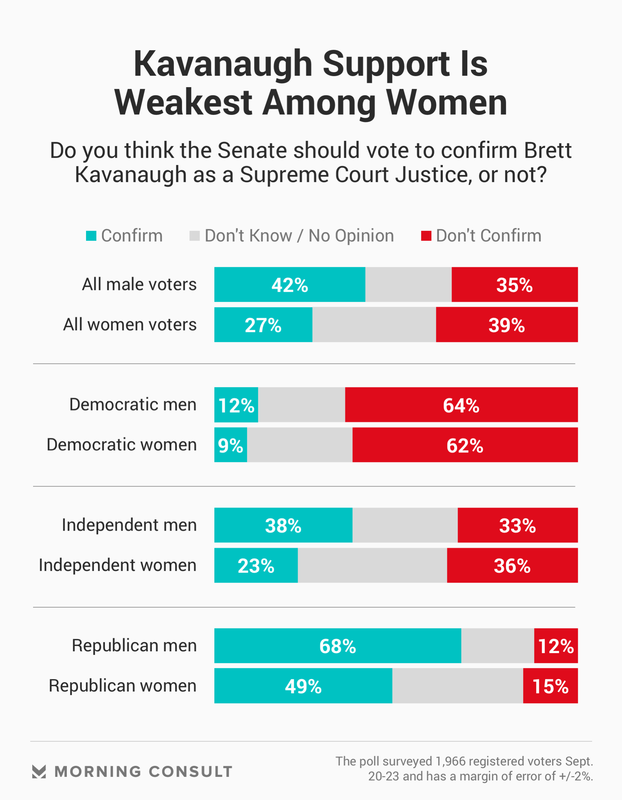 Opposition for Kavanaugh's nomination grows amid sexual assault allegations: This week, 37% of voters say the Senate should not vote to confirm Kavanaugh, compared to 34% who say he should be confirmed (29% DK/no opinion). Last week, 34% supported a Kavanaugh confirmation while 30% opposed (36% DK/no opinion). An uptick in GOP opposition: This week, the share of Republicans who oppose his confirmation dropped 11 points, with 58% support and 14% oppose. Voters predict GOP will retain the Senate, split on the House: 41% of voters believe the GOP will maintain control of the Senate, 32% say Democrats. Any references to the survey must be credited and linked back to Morning Consult/POLITICO. This poll was conducted from Sept. 20-23 2018, among a national sample of 1,966 registered voters. The interviews were conducted online and the data were weighted to approximate a target sample of registered voters based on age, race/ethnicity, gender, educational attainment, and region. Results from the full survey have a margin of error of plus or minus 2 percentage points.